Table Top Traysealers | Rpak Ltd. The RAM-10 seals film to smoothwall, plastic and paperboard trays. The heated platen creates a strong seal in approx. 1-2 seconds while the film is cut from the roll less than ¼” from the rear of the tray. Heat seals trays up to 11″ x 13″ x 4″ deep. Seals 8-12 trays per minute. Maximum film web width: 13.25″, Maximum film roll diameter: 10″, RAM-10 dimensions: 30″ L, 18″ W, 18″ H, weight: 50 lbs. (includes one tray carrier), Electrical: 115V, 10 Amps. USDA approved. The VS300 seals film to smoothwall, plastic and paperboard trays. 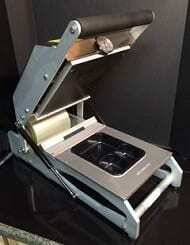 The heated platen creates a strong seal in approx. 1-2 seconds while the film is cut from the roll less than ¼” from the rear of the tray. Heat seals trays up to 10″ long x 8″ wide and 4 1/2″ deep. Seals trays 8-12 trays per minute. Maximum film web width: 9.25″, Maximum film roll diameter: 10″, VS300R dimensions: 25.75″ L, 14.0″ W, 9.25″ H (closed) / 21.5″ H (open) weight: 38 lbs. 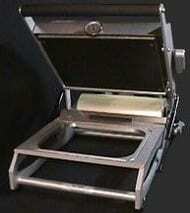 (includes one tray sealing carrier), Electrical: 110V single phase, 10 Amps. USDA approved.